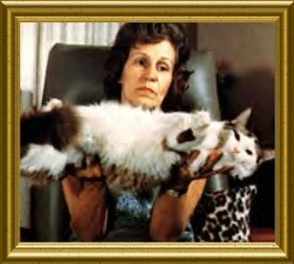 They are a large breed 10-25 pounds, that started in 1965 by a woman name Ann Baker. Ragdolls have the name because they are very floppy and some will lay limp in your arms, they should be an indoor only cat due to there delicate nature, they are a great breed for everyone including children once socialized. These cats have medium to long hair but do not shed hair in hunks and rarely mat up at all, this breed is a pointed breed, meaning it has points such as a simaese, they come in patterns of mitted , bicolor and point, mitted means they will have all four white feet, bicolor means they wil have an upside down V pattern on the face or so called a mask, pointed means all four feet are colored, this breed should keep its blue eyes, menaing breeders should not tamper with the lines and use cats with eyes of gold, yellow, green or copper, some breeders are breeding so called solid radgolls, these will have solid coloring not pointed and have a loss of blue eyes, replacing them with copper, yellow and so on, here at Castletopdolls I breed a few minks, the mink ragdolls are very close to pointed because they still have blue eyes, some will have aqua eyes which is still a blue color. we DO NOT breed any ragdolls that do not have blue or aqua eyes, these to me are mixed ragdolls and many ragdoll breeders will agree. 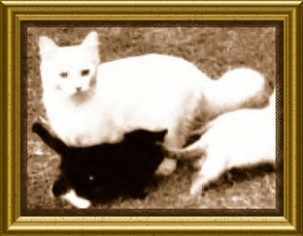 She produced solid black kittens and white kittens and kittens with white feet. Ann bred the colors down until she was satisfied with what she was producing. She created mink, solid and pointed. Ann wanted to create a pointed ragdoll and used the selected cats, solids and minks. 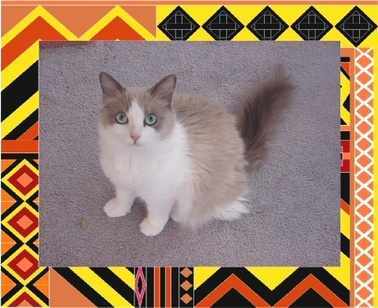 She produced her first show ragdoll cat (below) a seal bicolor, using the colored cats above. 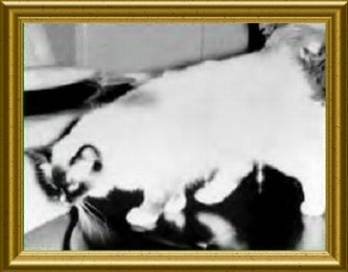 she also produced solid blacks whites and minks and sepia kittens which are very deep in color but prefered the pointed ragdoll, the seal bicolor cat below was shown in the 1970s and was recognized as the first Ragdoll, this was the traditional color and pattern called the pointed the cat shown here, is a seal bicolor. 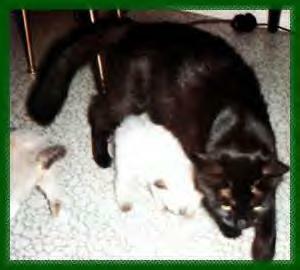 The cats she used for the Ragdoll breed were Persian, Burmese and Birman looking cats. Perhaps others were used. Buckwheat and Daddy warbucks produced the first registered Ragdolls. The only colors that Ann really wanted were Blue and seal and possibly lilac and chocolates. Other breeders around these times that were working with Ann had disagreemnets about the breed and were fed up with Ann as she was very demanding and wanted things her way. Ann had claimed that the ragdoll was part human and part raccoon this was one reason others working with her wanted to leave her side and start there own breed, these breeders went ahead and created a new breed Called the Ragamuffin, with Anns lines mink and solid, breeders used these to keep these colors in there breed while Ann steered twords the pointed. the ragamuffin has the same exact colors as the ragdoll such as traditional blue, seal, lilac and chocolate, the differences was that the new Ragdoll now called Ragamuffin had colors of mink and solid as well. Some breeders continued to breed the true mink and solid purebred Ragdolls and some went onto just breed Ragamuffins. Ann no longer used minks and solids but the fact is other Ragdoll breeder wanted to use them, some minks and solids are purebred registered ragdolls and some are now purebred registered Ragamuffins and some have a mix of both breed. Either way they are allowed to be used but some do not want these colors added and will make up stories that they are not pure but yet these breeders are breeding flames and lynx ragdolls which were not colors that Ann baker breed at all. Today Ragdolls comes in Flame, Lynx, mink and solid and these are pure SBT regsitered ragdolls unless on a pedigree one sees CON regsitered cats and not SBT this means another breed was used to get its color. Many breeders are working on pure mink and solid ragdolls and all SBT pedigree. I myself do NOT breed any Ragdoll that lacks blue eyes, I do not breed solids, to me solids were what Ann used to get the pointed Ragdoll, I do however breed a few minks with Aqua or blue eyes. When two minks are bred together you will get an even deeper color of the color being bred, this is called Sepia, it is not a solid ragdoll but of its own color. Most breeders that breed these still breed pointed as well. and there is no stopping these colors, if one looks on a 1970s or 1980s old pedigree you will see many mink and solid ragdolls these are indeed regsitered Ragdolls with no difference in personality or traits. 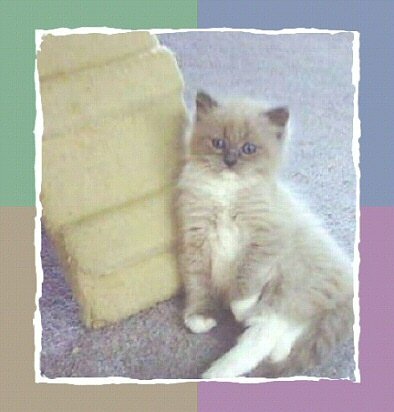 I do not breed solids because I feel the Ragdoll is suposed to be a blue eyed breed. I breed pointed and minks and the rare whites on occasion as these can have blue eyes. We do not plan on breeding any Ragdolls that do not have blue or aqua/blue eyes. Ragdolls were made to be and should be a blue eyed breed. If one does breed these I would hope that they would only breed solids to solids so there is no mix such as breeding a gold eyed ragdoll toma blue, that to me would be a mess !! My goal for minks in my cattery is to breed rich colors with bluer aqua eyes and ones with very fluffy coats and stocky build. When breeding minks we always try to use cats with deep aqua eyes and not the pale aqua, we use a pointed parent with extremely blue eyes bred to a mink with deep aqua eyes for a wonderful eye color effect. Solid ragdolls still basically the same, stem from older lines using Josephine's Offspring. Though it is rare to trace back an actual gene at this time these cats were used, many are still used in breeding programs and are indeed purebred Ragdolls but these ragdolls do not have blue eyes. A large amount of breeders do not want to breed Solids. By the breeder breaking down the colors, She got the pointed light body dark pointed look. Some breeders still use solids and minks to improve the lines of there traditional ragdolls and to widen the lines to perhaps lose unwanted bad genetic traits and lessen inbred lines. The only difference in the solid colors is that only the whites will have blue eyes. Some solid whites will have green or gold. solid blacks will have gold or green sometimes extremely rarely blue eyes. Solid ragdolls are slightly more stocky with slightly a different eye shape, there coats are thicker but slightly shorter then pointed ragdolls this is more true if they are not pure SBT solid ragdolls. The solid colors are Black solid, black in mitted and bicolor, solid blue in all patterns. calico in all patterns. Solid white, solid Red. The solids can also be torbie. that is lynx with black and flame also called calico lynx, Solid chocolate and lilac. If this were a pointed lilac bicolor it would be very light in color and the body would be off white with a pink tint. Love potion, a darker Smokey blue then a pointed blue. She is a blue mink. A mink always has body color that looks Smokey and will have aqua eyes. 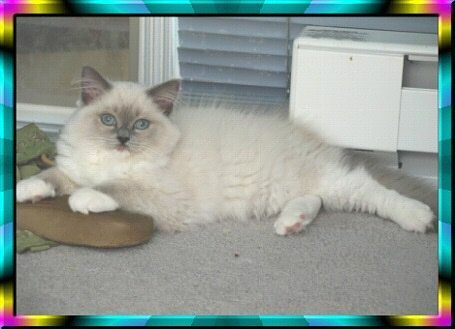 Pointed blue mitted, light body color. Traditional pointed ragdolls should always have blue eyes, very rarely they will have a hint of green, this is due to the older genes or lines showing themselves again or mixes of genes, also if one crosses to may solids in there pointed line one can lose bluer eye color! I myself and most breeders always want to be sure that the pointed ragdoll has only the blue eyes, so when breeding pointeds to minks or solids, deeper blue eyes should be bred to weed out any green on pointed type kittens.